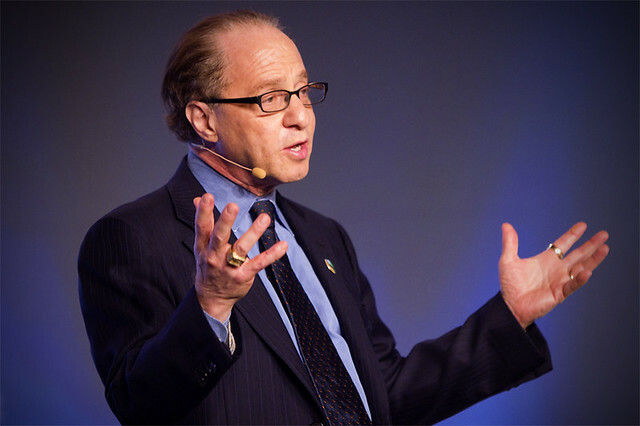 Ray Kurzweil, helping us become more like gods. "Now the serpent was more subtil than any beast of the field which the Lord God had made. And he said unto the woman, Yea, hath God said, Ye shall not eat of every tree of the garden? Futurist and Google exec Ray Kurzweil thinks that once we have robotic implants, we'll be funnier, sexier and more loving. Because that's what artificial intelligence can do for you. I suspect a few of you are looking forward to being robots. Who wouldn't be fascinated by the idea of becoming someone other than themselves? We do get so tired of being the same dull soul every day. What kind of robots will we be? Happily, I can provide an answer. For living inside my head all day have been the words of Google's director of engineering, Ray Kurzweil. For more than a curt while, he's been keen on humans going over to the bright side. He's predicted that humans will be hybrid robots by 2030. But what will this be like? More importantly, what will this feel like? Are you ready to engage what's left of your humorous humanity when I offer you the information that Kurzweil believes we're going to be quite wonderful people when we're part robot? Kurzweil has a truly, madly, deeply optimistic view of who we will be when nanobots are implanted into our brains so we can expand our intelligence by directly tapping into the Internet. This is such a relief. I had feared that when a robot was implanted into my brain, my head would hurt. I was afraid that I wouldn't be quite in touch with my feelings, as I wouldn't be sure if they were real or just the promptings of my inner robot. Kurzweil, though, has reassured me. Speaking recently at Singularity University, where he is a member of the faculty, he explained that my brain will develop in the same way my smartphone has. "We're going to add additional levels of abstraction," he said, "and create more-profound means of expression." More profound than Twitter? Is that possible? Kurzweil continued: "We're going to be more musical. We're going to be funnier. We're going to be better at expressing loving sentiment." Because robots are renowned for their musicality, their sense of humor and their essential loving qualities. Especially in Hollywood movies. Kurzweil insists, though, that this is the next natural phase of our existence. "Evolution creates structures and patterns that over time are more complicated, more knowledgeable, more intelligent, more creative, more capable of expressing higher sentiments like being loving," he said. "So it's moving in the direction that God has been described as having -- these qualities without limit." Yes, we are becoming gods. "Evolution is a spiritual process and makes us more godlike," was Kurzweil's conclusion. There's something so uplifting, yet so splendidly egocentric in suggesting that man will soon be God, thanks to artificial intelligence. The mere fact that this intelligence is artificial might be a clue as to its potential limitations. Moreover, I rather think of us as a dangerous species: Primitive, yet believing we're so very clever. There are so many fundamental things with which we struggle. Here we are, though, believing that we'll be godlike in a few years' time.